Fresno property transforms into a true African setting at the Fresno Chaffee Zoo. Guests wandering through the African Adventure exhibit feel as if they have actually landed onto a different continent. Authentically styled habitats ensure thriving animals and the species here are content in their Fresno homes. A bit like on safari travelers will spot giraffes, lions, rhinos and elephants. Take a peek by viewing the live web cam here. Listen to the roar of the lions well before spotting the pride. A magnificent herd of elephants trumpet in response nearby. White rhinos are in jeopardy in the wild. Stop by and learn all about them and how to help protect these majestic beasts. Cheetahs are the fastest animals on land. Spectators will be seeing spots as they zoom past. Visitors get to know gentle giraffes up close and personal at the Twiga Terrace Feeding Station. Long and lanky, these sweet creature amble up close to accept lettuce leaves from friendly guests. 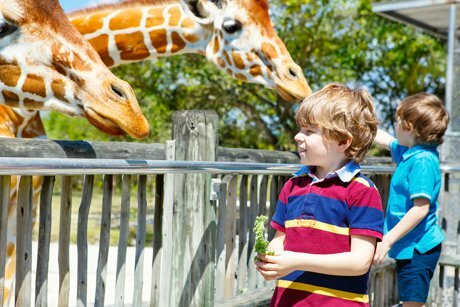 Feeding the giraffes is an amazing experience for one and all. The views of the zoo are spectacular on top of the terrace. From these heights a 360 degree view of the savanna is seen making it easy to plan out where to explore next. When planning the day at the Fresno Chaffee Zoo be sure to check the daily schedule. Keeper chats are great ways to pick up extra insight and information about favorite critters. Oftentimes other special events are in the works as well. Future generations hold the lives of exotic animals in their hands. Educational programs help teach them about animals when they are young. Designed just for four and five year olds, Tot Time introduces live animal friends to youngsters and features crafts and stories. Periodic zoo camps allow kids an intimate showing of the zoo. The Zoomobile heads out into the community on a regular basis with animal ambassadors ready to make new human friends.